Click the whippin' toad above to learn more about The Great and Powerful Toad. We're probably done with updates now. Hope you all enjoyed the ride! The last batch of over 150 Electronic Toad Hall entries will be shipped off to the suits soon. We're no longer accepting submissions to the ETH or the mailing list thing. I, like Eisner, just don't care what those jerks do to WDW anymore. Time to move not-quite-so-merrily on. There are now over 1100 Electronic Toad Hall entries. I still have a bunch more to add, but I don't have as much time for this stuff as I used to. The end is finally in sight, tho. ...and so do the 1500 people who are still on the mailing list. www.savetoad.com gets its 60,000th hit. Obviously things are trailing off now...and I can't say as I'm complaining about the free time! An even more final Toad In is held to protest the grand opening of the new Winnie the Pooh ride. The event generates a lot of press coverage, most of which is a result of this Associated Press Story. The Electronic Toad Hall now has over 1000 entries. I've had as many for some time, but only now have I had time to add them to the site. There are still many more to come! A feel-good letter from a Disney customer appears in Disney Magazine. Considering that the "magazine" is nothing more than a large advertisement for Disney masquerading as a periodical, I suppose it's nice that they even acknowledged that anyone might be unhappy with the change. Over 600 Save Mr. Toad t-shirts have been sold...and we're all out of them! No more big box of green shirts in my living room! We've now distributed over 13000 SAVE TOAD postcards...and we're all out! I am now officially out of the postcard business! Woo hoo! Still processing those Electronic Toad Hall entries, tho. Over 850 there now and still hundreds to go. The Electronic Toad Hall now has over 750 entries. I'm still processing entries from September, so there's lots more to come. Over 500 Save Mr. Toad t-shirts have been sold. www.savetoad.com gets its 50,000th hit. We've now distributed over 11000 SAVE TOAD postcards. The Save Toad cause receives high class press in The New Yorker in an article entitled Save Mr. Toad's Wild Ride. We also get mentioned in this week's edition of Sports Illustrated. A columnist for the Daytona Beach News-Journal vents in this article called Mr. Toad squashed in the name of Pooh. We've now distributed over 10000 SAVE TOAD postcards. Over 300 Save Mr. Toad t-shirts have been sold. The final Toad In makes front page news in the Orlando Sentinel article Fans don't go gentle on that last wild ride. There's also a nice editorial in the Cape Cod Times entitled Have the weasels won?. Farewell, old friend...Toad is no more. The article I wrote for the Palm Beach Post, as well as bunch of other stuff appeared in the Post in a two-page spread entitled Requiem for Mr. Toad. I have finally written up the Final Toad In Report and now the pictures are up as well. Also, two news stories ran on the Orlando ABC affiliate (ha!). One before the closing and one after the closing. Those of you with slower connections will be interested in the smaller before and after videos. Other stories: NPR Report, CFN Report (large and small versions), Fox News Report (large and small versions). Finally! All the news footage I have has been digitized! A Fox News Story about the upcoming Toad closing and protest airs on teevee. If you have a small pipe, you can download the smaller video file. It's the same story, but the screen is half the size. This E! Online article also mentions the closing of the Submarine Voyage in Disneyland. The article's entitled Mickey Mouse Cleans House. More national press in the USA Today article End of the Road, Toad and the Washington Post article Fans Are Hopping Mad as Toad's 27-Year Ride Ends. Disney FINALLY admits their evil scheme, less than a week before The Ride is scheduled to close. The Toad story hit the AP Newswire and has been all over the place ever since. The AP article led to stories at CNN, Wired/Reuters, NPR, ABC National Radio (or was it NBC?) and a buncha other places, not all of which have been listed here. I have honestly lost track of all the press. I'm sure I'll never see a lot of the articles, but since an awful lot of them are just reflections of the AP article, that's not such a horrible thing. CNN also ran a little thing about us on teevee. Over 9000 SAVE TOAD postcards have now been distributed. An article entitled Net protest can't save Mr. Toad runs on c|net's News.Com, sending our hit counter thru the roof again. www.savetoad.com gets its 30,000th hit! The Electronic Toad Hall now has over 600 entries...and I'm way behind in adding them! Over 250 Save Mr. Toad t-shirts have been sold. The Save Mr. Toad mailing list thing is now sporting over 1000 members. A thousand good customers who Eisner couldn't give a damn about. Over 8000 SAVE TOAD postcards have now been distributed. The Save Toad message is featured on the show Mountain View Speaks Out on KMVT in California, thanks to way cool Toad supporter Daniel Mart. The video is not terribly interesting (just white letters on a blue background), so you might prefer to hear just the audio portion. This is an extended version of Daniel's letter which was previously published in the Palo Alto Daily News. The spirit of Ben Franklin guides www.savetoad.com to its 25,000th hit on our country's Big Day. Over 7000 SAVE TOAD postcards have now been distributed. The Save Toad message is featured on Palo Alto community access television, thanks to most excellent Toad supporter Daniel Mart. Well, those boneheads at Wired News got it wrong again in this article about the Save the Enchanted Tiki Room page that also mentions the Save Toad movement. First of all, the Iago and Zazu update of the Tiki Room was made to the Disney World version of the Tiki Room, not the Disneyland version, which is the one in danger of becoming a food court. Then, the author makes light of the fact that, at the time, there were "only" 338 signatures on the online petition, without any idea of how long the site has been up. (There's been more than 200 new signatures in the last couple of days, by the way.) And THEN there was a quote attributed to a Disney official spokesperson...probably about the Tiki Room, but the article said it was about the Pooh invasion. When some people wrote Wired to clear this up, they just removed the line entirely. Team Toad, along with our West Coast sister cause, Save the Enchanted Tiki Room, get recognition in an article entitled Net aflame with Disney protests on c|net's News.Com. Not bad. The Electronic Toad Hall now has over 500 big entries. An e-mail of mine gets broadcast on a local news station. Check it out here. It's kinda funny. The Save Mr. Toad's Wild Ride Website receives its 20,000th hit! Toad In VI-ish gets teevee coverage on Fox News! See the video! This pro-Toad Letter to the Editor is published in the Palo Alto Daily News. Thanks to Daniel Mart of Mountain View, California for taking the time to submit the letter. Another Toad In takes place, as they do every week, but I've gotten a report on this one. Over 200 Save Mr. Toad t-shirts have been sold. Over 6000 SAVE TOAD postcards have now been distributed. Toad In V (give or take a few) is a success. The numbers don't really mean much now that we protest every weekend, but I can only report on the ones I attend. A new Promote Wind in the Willows web site comes online. Please visit the site and do what you can to give this 1996 movie a decent release. Terry Jones commands you to. Hey, Wired News ran another article on us, a little bitty one this time. Plus, it's mostly error-free! Check out the story they titled Toad Kill?. Official Save Toad buttons become available online. Toad In 4.5 (or whatever) goes on without me! The Save Toad cause gets very nice coverage in the Orlando Business Journal. The article is entitled Save-the-Toadies Launch Amphibious Assault. Over 5000 SAVE TOAD postcards have now been distributed. New and improved SAVE TOAD postcards are now available. 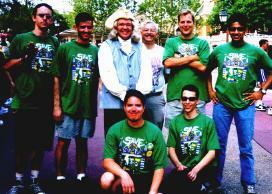 The Save Mr. Toad's Wild Ride Website receives its 15,000th hit! The Electronic Toad Hall hits 400 entries (and still chugging along). The second official Save Mr. Toad's Wild Ride flyer is put online, and is available in both monochrome and color versions. The first official Save Mr. Toad's Wild Ride flyer is made available for public consumption. It's totally free, of course. Over 4000 SAVE TOAD postcards have now been distributed. The Save Toad cause receives coverage on WMFE-FM, National Public Radio. Toad In IV has the largest turnout yet! The Save Mr. Toad mailing list thing now has over 500 members. The Save Mr. Toad's Wild Ride Website receives its 10,000th hit! The Electronic Toad Hall hits 300 entries (and still going strong). Over 3000 SAVE TOAD postcards have now been distributed. The Toad Cause is featured on the front page of the Kendall Gazette's February 5-11, 1998 issue in an article entitled Resident goes into cyberspace to save Disney's Mr. Toad ride. Over 100 Save Mr. Toad t-shirts have been sold. Over 2000 SAVE TOAD postcards have now been distributed. You can now have a gander at our SAVE TOAD postcards before you order them. They are 100% free, of course. The Save Toad page is featured on the front page of Scandinavia Online in an article entitled Paddekampanje mot Disney. A Norwegian Toad fan reports: "By the way, if you don't understand Norwegian.... SOL says that Mr. Toad's Wild Ride is one the biggest rides at WDW." The Save Toad site receives national television exposure on c|net Central. The show aired on both the USA Network and the Sci-Fi Channel today. It looks like it will also run again Monday night at 1:00am (aka Tuesday morning). More HTML fiddling you couldn't possibly care about has been completed. Toad In III upholds the fine tradition of Toad Ins I & II. An article entitled Users wild over Disney ride runs on c|net's News.Com. Instant national exposure gets our web page counter spinning furiously. Nearly pointless, but difficult, tinkering with the Save Toad site's HTML is complete. For now. The Electronic Toad Hall hits 200 entries (and climbing). The Save Toad cause is highlighted in the January/February issue of New Horizons newsletter in an article entitled Mr. Toad Needs Your Help!. This site is also named January's Site of the Month. Over 1000 SAVE TOAD postcards have now been distributed. The Official Disney web site highlights "The Adventures of Mr. Toad" on the front page of their weekly Story Section. They also highlight how horrible their artist is as the absolute worst drawing of Mr. Toad I've ever seen is shown on this page. (The original horrible artwork is no longer there, but the story still is. You can find it right here. The Save Toad cause is highlighted on RockDaily.com. A nice article documenting the December 7 Toad In runs in the Orlando Weekly. The Friends of Toad and Miscellaneous Toad pages premiere on this site. JT appears on Chicago's The Loop, WLUP FM 97.9 for the second time. JT is interviewed by Yahoo! Internet Life. The second Toad In is even better than the first! The Palm Beach Post article appears on the front page of the Accent section. It's quite good, but doesn't make us sound very intimidating. Altho, I suppose, we aren't. The Save Toad web site is declared a "best bet" by Ed Stansel's Web Watch in the Florida Times-Union article Best bets on the Net. Mr. Toad's Wild Ride gets a nice write-up in The Mining Company's Guide to Theme Parks. JT appears on Chicago's The Loop, WLUP FM 97.9. JT is photographed by The Palm Beach Post. See the official Save Mr. Toad's Wild Ride t-shirt! JT is interviewed by The Palm Beach Post. The Save Toad cause is featured in Steve Otto's column in the Tampa Tribune. Check out the section entitled Hopping Mad. The Save Mr. Toad mailing list thing hits 200 members. The first Toad In is a success! We're on the front page of the Miami Herald. The story gets picked up by Associated Press and we appear in newspapers and television and radio stations all over the country! We appeared in the Palm Beach Post, Tampa Bay Online, The Daytona Beach News Journal, The State (Columbia, SC) and probably a lot of other papers. JT is interviewed and photographed for an article in The Miami Herald. Wired News runs a story entitled Warts and All, Fans Stand Up for Their Toad regarding the Toad cause...unfortunately they several times refer to Disneyland instead of Walt Disney World. The Lampwick's Disney News Poll comes to a close, with Toad winning two thirds of the vote (more support than our President got in the last election). The first Toad Day takes place, with interesting results. Many Disney Store employees incorrectly tell Toad fans that Mr. Toad is not even a Disney character. One day after the request went out, a volunteer has created the Promote The Wind in the Willows page. Please visit it frequently and help support Toad's film career. Not one, but two pro-Toad Letters to the Editor have been published in the Orlando Sentinel. Thanks to Brad Grant of San Francisco and Sandy Melillo of Fort Lauderdale for their efforts. The Save Mr. Toad site is selected as the "Cool Site of the Day" by TUTIC ("That's Useful, This Is Cool!"). JT meets with Terry Jones (writer, director, and star (as Toad himself)) of The Wind in the Willows. Click here to find out what happened. The Electronic Toad Hall hits 100 entries (and climbing). Now all the current addresses and phone numbers are available in a single file. Write: WDW Attractions, PO Box 10000, Lake Buena Vista, FL 32830, Attn: Merchandise and tell them that you wish they had some Mr. Toad merchandise available in Walt Disney World, especially considering the mountains of Pooh products in the stores. The best article documenting our fight so far, in City Link Magazine. It's a good read, with solid data, some interesting quotes from an official Disney representative (to paraphrase: "The ride is very popular and everyone likes it, but we don't care.") and some amusing stuff, too. It's called Showdown in the Mouse House. Check it out. The Walt Disney World Info Line (407.824.4321) begins telling people that Mr. Toad is "definitely closing". Disney Publicity (407.397.6397) neither confirms nor denies this statement. Still no one admits responsibility for the decision. JT is interviewed by TM Shine of City Link magazine. Our story runs in the Monday Tourism & Travel print edition of the Orlando Sentinel. The Save Mr. Toad mailing list thing hits 100 members. Toad supporter Rich Rotondo gets his Letter to the Editor published in the Orlando Sentinel. Our story runs in the Friday Extra print edition of the The Tampa Tribune. We receive online coverage on Deb's Unofficial Walt Disney World Information Guide (WDWIG). The Mr. Toad's Wild Ride Survey comes online. The Electronic Toad Hall features its 50th customer response...and still going strong. We receive online coverage in The Tampa Tribune. The main Save Mr. Toad's Wild Ride page receives a facelift. Page navigation is also improved. The More on Toad page is updated. Two fan-created buttons (this one and that one) added to the site. Download the button of your choice and use it to link to us. Letter templates are added to the site. The Learn More About Mr. Toad page premieres on the site. Our story runs in the Sunday print edition of the Atlanta-Journal Constitution. Visit Lampwick's Disney Survey for the month of November and vote for Toad! The site is entered into several banner networks. We receive online coverage in the Atlanta Journal-Constitution. The Electronic Toad Hall and Our View pages premiere on the site. JT is interviewed by Rich Eldredge of the Atlanta-Journal Consititution. It is true that plans are currently being discussed for the possible replacement of Mr. Toad's Wild Ride in the Magic Kingdom Park with an attraction that would feature a more current theme and more modern technology. We would like to clarify, however, that no final decision has actually yet been made regarding the future of this attraction. 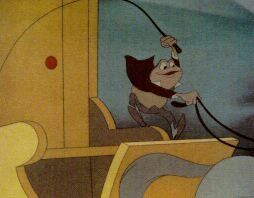 E-mail: All your friends and let them know about Mr. Toad's plight. Phone call received from LA Times. Double-checking our story. Reporter provided support, but no coverage. First major press release issued. Vote for Mr. Toad in the online poll and voice your support for Toad in the online forum at Digital City Orlando. Download our banner and link it to the Save Mr. Toad site. Put the Save Mr. Toad site URL (http://www.math.miami.edu/~jam/toad/proj.html) in your signature file. The Adventures of Ichabod and Mr. Toad airs on the The Disney Channel. The Orlando Sentinel runs an article entitled Toad or Pooh? Celebrities Take Sides. Hootie admits he is the anti-Christ. John Lefante creates the Save Mr. Toad web site. "I believe you'll be hearing from me again."